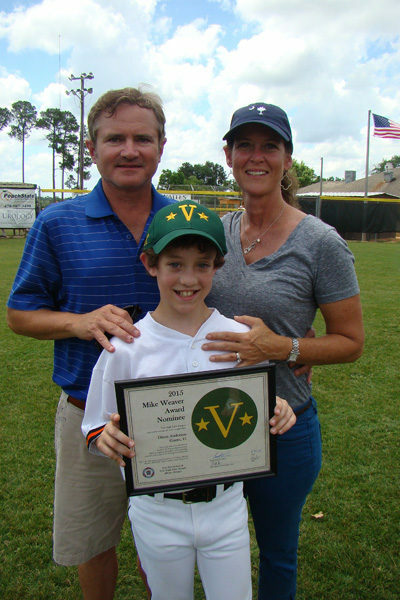 Dixon Anderson, the son of Wally and Flinn Anderson of Monroe County, was named the recipient of the 2015 Mike Weaver Award at Vine Ingle Little League on May 30. 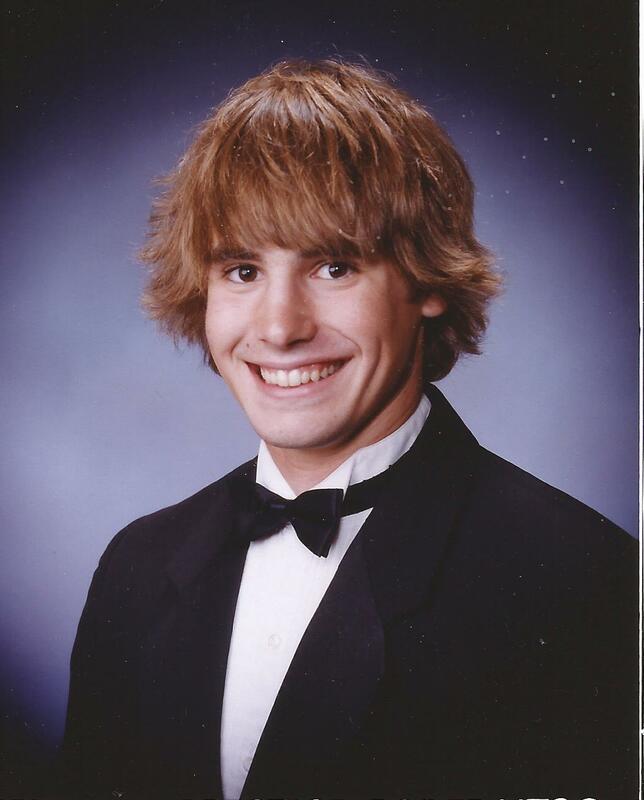 Dixon was selected from a group of nine other nominees, all of them 12-year-old players in the Major League. The other nominees posed for this photo with several previous winners of the award. 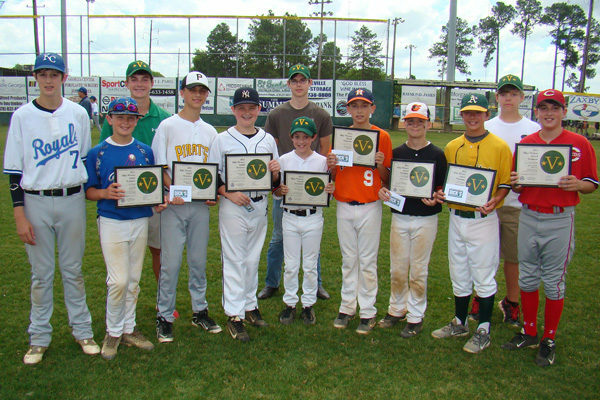 The nominees were, front row from left, Ben Baxley (Royals), Jase Smith (Dodgers), Bowen Kramer (Pirates), Jackson Martin (Yankees), Dixon Anderson, Thomas Smith (Astros), Malone Hudson (Orioles), Knox Cleveland (A’s) and Stetson Hatcher (Reds). In addition to the nominees mentioned above, this photo includes others attending the ceremony. 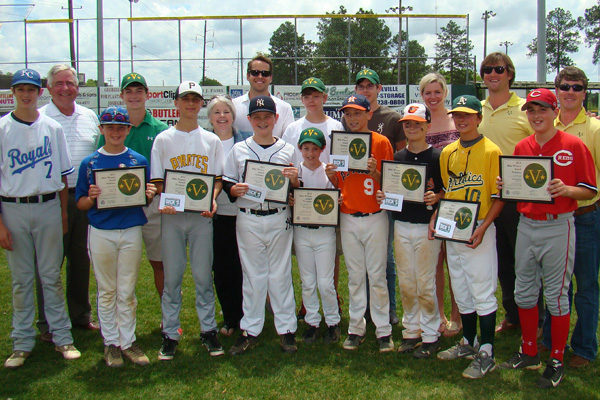 Back row, from left, Bill Weaver (Mike Weaver’s dad), Jay Spivey (2013 award winner), Erin Weaver (Mike Weaver’s mother), Dan Weaver (Mike’s brother), Henry Meyer (2014 award winner), Drew Edge (2012 award winner), Rachel Phillips, Adam Dukes and Stephen Adams, three of Mike’s friends who have worked diligently to raise money to support the Mike Weaver Award.